Dr, MMS was subservient (besides and perhaps due to Sonia Gandhi) to the UPA allies and let them get away with anything. Notice while watering the plants for Mamata, he was humble but not sweating. Now for Mulayam he is humble and sweating. 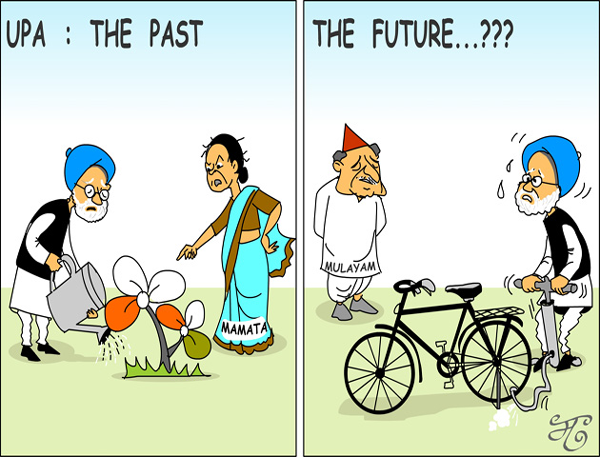 His fate (also UPA's) is sealed. This is what happens when retaining the chair and the power (what power?) are the sole principles of governing. You are a brilliant cartoonist.